Afghan security forces stand guard near a terrorist attack site, close to the Spanish embassy, in center of Kabul, Afghanistan, Dec. 11, 2015. The Taliban has claimed responsibility for a car bombing and gunfire in a diplomatic neighborhood of Kabul that killed at least six people, including four police. Several other people were wounded in the attack that began Friday and continued into Saturday. A nearby hospital run by an Italian charity reports it treated several victims. Taliban spokesman Zabihullah Mujahid told VOA that a guest house was the target because he says it was being used for military activities and intelligence sharing. "We had been watching it for a long time and finally attacked it today. A large group of our Mujahideen assaulted this important target. It started with one of our men blowing up an explosives-laden car allowing others to enter the facility. A number of foreigners were present inside the building," Mujahid said. Witnesses say at least three attackers were involved. In Washington, State Department spokesman John Kirby said that despite the violence, the United States believes it must continue to work for a reconciliation between all parties in Afghanistan. "Nobody wants to see violence of this sort in Kabul," he said. "It does underscore the fact that Afghanistan still remains a dangerous place and also underscores the urgency and the need for there to be continued support for President (Ashraf) Ghani and Chief Executive Officer (Abdullah) Abdullah toward an Afghan-led reconciliation process." Afghan Interior Ministry spokesman Sediq Sediqqi tweeted that a car bomb appeared to be the source of the explosion. Heavy gunfire followed the explosion, and a reporter near the scene said police reported at least three attackers were involved. Initial reports said the attack may have targeted the Spanish embassy. But a short time later, a spokesman for Spain’s Office of the Presidency told VOA that, according to Spanish Prime Minister Mariano Rajoy, the attack was not aimed at the embassy, but at nearby buildings. 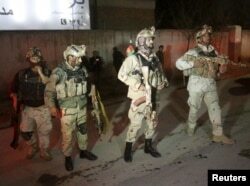 Friday's attack in Kabul followed a 27-hour siege of an airport in southern Kandahar on Tuesday and Wednesday. At least 10 armed Taliban fighters equipped with suicide belts took part in the attack, which left 54 people dead, including 39 civilians. In a separate incident Friday in Jalalabad, in eastern Afghanistan, an Afghan intelligence operative, a foreigner and her three children were killed by a bomb blast. Alberto Pimienta, Ayaz Gul and VOA's Afghan news service contributed to this report. Members of Afghan Crisis Response Unit (CRU) arrive at the site of a Taliban attack in the Afghan capital of Kabul, Afghanistan, Dec. 11, 2015.